Mayor Pete Buttigieg is not your typical candidate for president. A previous version of this video misstated the age when Buttigieg was elected mayor. WASHINGTON – The growing field of Democratic candidates running for president in 2020 has received considerable attention this year, but that hasn’t stopped President Donald Trump from socking away huge sums of campaign cash for his reelection. Underscoring the power of incumbency and a base of core supporters who have remained loyal despite a barrage of controversies, Trump raised more campaign money in the first three months of 2019 than any of his Democratic challengers and pulled in more than half of it from coveted small-dollar donors he can return to again and again. Trump raised $30 million in the first three months of 2019, according to campaign reports filed Monday with the Federal Election Commission roughly nine months before the Iowa caucuses. Vermont Sen. Bernie Sanders, with $18.2 million, had the largest haul among candidates seeking the Democratic nomination. Early campaign cash rarely predicts who will win an election, and additional Democrats such as former Vice President Joe Biden are still considering a run, a move that could upend the race. But there is a key political subtext to the numbers: Candidates will need a significant amount of money to get noticed among their competitors. At this same point in the 2008 election cycle, both Barack Obama and Hillary Clinton had raised some $26 million each. None of the Democratic candidates running this year came close. Two factors explain the difference: There is larger field of Democrats candidates this time, and the focus – for now – is almost entirely on small donors. Institutional Democratic donors have been wary to engage in the race until they have a better sense of who stands a good chance of winning the nomination. Others are likely waiting to see if Biden can overcome allegations of inappropriate behavior. For now, the situation is uncertain, and that makes many donors hesitant to risk getting involved. Campaigns put a big emphasis on early fundraising, blasting out press releases to tout how much cash came in during the first hours of a candidate’s nascent effort. That may be partially because those early hours are some of the most lucrative. California Sen. Kamala Harris had her best fundraising day of the quarter when she entered the race in late January, pulling in more than $500,000, according to a USA TODAY analysis of itemized contributions on her report. When small-dollar donors are included, the campaign said at the time it raised $1.5 million in its first 24 hours. Sanders experienced a similar rush of cash when he announced his campaign on Feb. 19, pulling in more than $780,000 in donations over $200, according to the USA TODAY analysis. The Sanders campaign had said its total haul, including small-dollar donors not itemized on FEC reports, was around $6 million on its opening day. Another predictable big day for campaign fundraising: The final day of the quarter, or March 31. That’s when aides blast a flurry of emails soliciting last-minute cash. Republicans often criticize Democratic candidates for taking money from “Hollywood celebrities,” but that didn’t stop the stars from shimmering in several reports. Actors Ben Affleck, Elizabeth Banks, Eva Longoria Baston and Jon Hamm all gave to Harris, who represents Hollywood and the rest of California. Emmy award winner William Macy gave $1,000 to Harris. Actress and comedian Wanda Sykes gave $500. While Harris has an impressive array of acting talent backing her campaign, she wasn’t the only Democrat to attract famous names. Jane Lynch, best known for her role in the television show Glee, and Bradley Whitford, who played White House chief of staff in NBC’s long-running West Wing, both gave to South Bend Mayor Pete Buttigieg’s campaign. New Jersey Sen. Cory Booker received several donations worth more than $2,000 in total from Rosario Dawson. The movie and TV actress is also Booker’s girlfriend. With the buzz over small-dollar donors among Democratic candidates, it can be easy to overlook the fact that Trump draws a significant share of his campaign cash from supporters giving less than $200. Among the money given directly to the president’s campaign, just more than half arrived in small bills. An incident at a California Starbucks involving a Make America Great Again hat has led to one person losing her job. Trump drew most of his money from a pair of joint fundraising committees. One of those entities, Trump Make America Great Again, transferred more than $20 million to the Trump campaign in March – most of which was collected in small amounts. The committee is where proceeds wind up when supporters purchase “Make America Great Again” hats and other merchandise on the Trump campaign website. Sanders, the Vermont independent who fired up progressives in the 2016 primary election, took 84% of his money from small-dollar donors. That compares with 70% for Massachusetts Sen. Elizabeth Warren, 64% for Buttigieg, 59% for former Texas Rep. Beto O’Rourke and 37% for Harris. Candidates tout their small-dollar donors as an expression of grassroots support, but there is a practical reason for amassing a large group of people willing to give $5 here and $10 there. Unlike donors who give thousands up front and quickly hit contribution limits, campaigns can turn to small donors repeatedly throughout the course of the race. 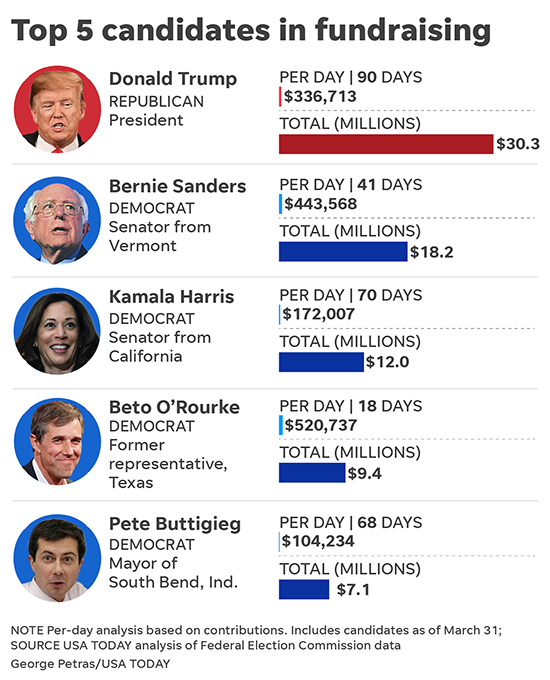 Buttigieg not only raised more than several Democrat contenders who started the year with a higher profile, he also was among the most frugal. The South Bend mayor spent about 10% of the more than $7 million he collected in the first quarter. Those at the other end of the “burn rate” scale include Warren and Sen. Kirsten Gillibrand, who spent more than 80% of their new donations. Warren transferred $10 million from her Senate campaign to her presidential effort to help pay the bills. But that’s not a cushion candidates will be able to rely on for long. Warren and Sanders racked up the most expenses among the Democrats – shelling out more than $5 million each. They also ended the quarter with the most money in the bank. Sanders had nearly $15.7 million. Warren reported $11.2 million. By comparison, Trump reported a war chest of nearly $41 million. Warren spent nearly $1.2 million on salaries, her largest expenditure, according to a USA TODAY analysis. That was closely followed by $905,000 in internet advertising. Sanders’ campaign spent $1.6 million on digital advertising, according to the analyses.